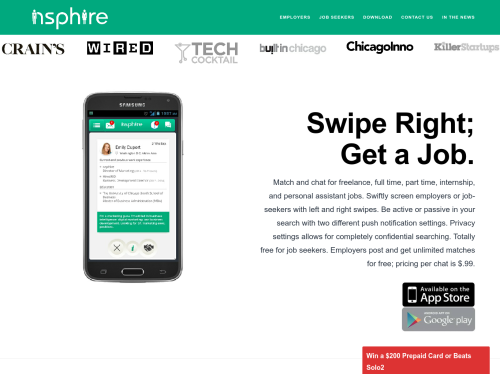 nspHire is a new job matching app that has a look and feel similar to Tinder. The nspHire app includes privacy settings to allow for confidential job and job-seeker searching. The app has two different push notification settings. Set to ALL and receive a notification whenever someone swipes you right. In this way, you can be passive and still match with a job or candidate. Set to Mutual, and receive a push notification only when someone swipes you right that you have already swiped right. The app includes in-app messaging. It is free to use for job seekers. Employers don't pay to post or match, but only to chat within the app.